Antique pool tables are a treasure indeed. Quality pool tables--antique or not--have six legs and three pieces of heavy slate in the bed. If you're looking at a pool table that doesn't have these, it's definitely not an antique. Compared to today's mass-manufactured pool tables, antique pool tables are considered to have been made from higher quality materials and with superior craftsmanship. There are many other factors to consider, making identifying a pool table as antique a difficult task. Check the quality of the materials used to make the pool table. Antique pool tables are made of wood, not plastic. They were most often made from satinwood, but many pool tables that were manufactured in the 1800's used several types of wood. (Some manufacturers used up to seven different woods on one pool table.) The top of an antique pool table will be covered in wool, not felt. Look for a maker's or manufacturer's mark underneath the pool table. 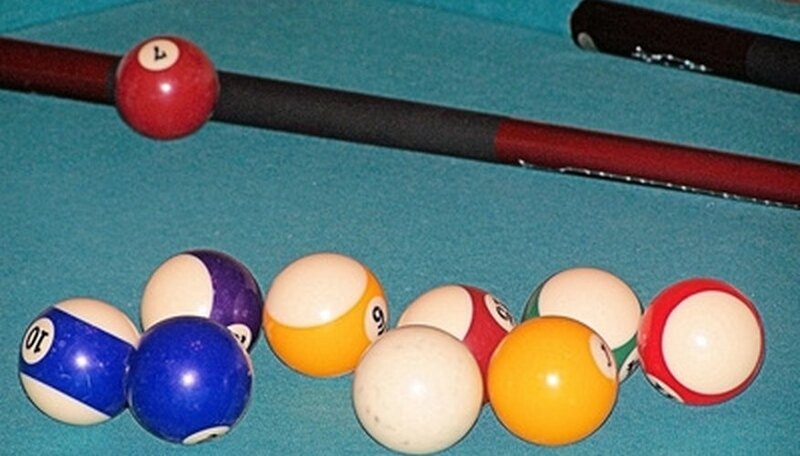 The most recognizable name in pool tables is Brunswick, which is still in business today. Many of the companies that produced pool tables in the 1800's are no longer in business, so it's a good idea to know at least some of the manufacturer's names from that era. Just a few notable manufacturers were Oliver Briggs, August Jungblut and Kansas City Billiard. Observe the overall impression of the pool table. Antique pool tables are characterized by ornate designs on the cabinet panels (the sides). It's not unusual to find ivory or diamonds inlaid in the rails. In other words, antique pool tables look fancy. If you're looking at a very plain table, don't let anyone tell you it's an antique. Measure the table. Antique pool tables are usually 8 to 10 feet long. But this is the least of the clues because there are antiques smaller than 8 feet. Size alone is not a great indicator of whether or not the table is antique. Always ask a seller if any part of the pool table has been remanufactured.